The Peace Arch stands on the international boundary between Blaine, Washington, and Douglas, British Columbia and symbolizes America's and Canada's shared heritage and a friendship that accounts for the longest, undefended border in the world. The Peace Arch is the third in our masthead photo series on monuments to faith and freedom. The Arch was constructed to commemorate the centennial (1814-1914) of the signing of the Treaty of Ghent on December 24, 1814. That treaty ended the war of 1812 between the United States and Great Britain, a conflict that was waged in North America and involved Canadians, as well as Americans and British. This noble edifice standing 67 feet tall, was dedicated in 1921. The Arch is crowned by the U.S. and Canadian flags and there are inscriptions on both sides of its frieze. 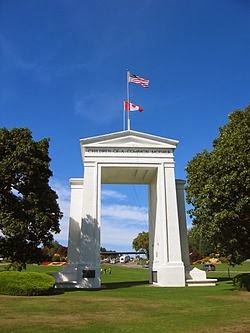 The inscription on the U.S. side of the Peace Arch reads "Children of a common mother", and the Canadian side is inscribed "Brethren dwelling together in unity". Within the arch, each side has an iron gate hinged on either side of the border with an inscription above reading "May these gates never be closed". The Peace Arch is an enduring reminder of sentiments expressed by President Kennedy when he addressed the Canadian Parliament in May 1961 and spoke of our "shared legacy:"
"But we share more than a common border. We share a common heritage, traced back to those early settlers who traveled from the beachheads of the Maritime Provinces and New England to the far reaches of the Pacific Coast. Henry Thoreau spoke a common sentiment for them all: "Eastward I go only by force, Westward I go free. I must walk towards Oregon and not towards Europe." We share common values from the past, a common defense line at present, and common aspirations for the future-our future, and indeed the future of all mankind. Geography has made us neighbors. History has made us friends. Economics has made us partners. And necessity has made us allies. Those whom nature hath so joined together, let no man put asunder."